When your map includes web feature layers or web tile layers, you can take that map offline and complete your work without a network connection. The Download Map button is available if feature layers are configured to support synchronization, or if tile layers are configured to support exporting tiles. When you take a map offline, the data for each web feature layer that supports synchronization is downloaded to a geodatabase in the project's home folder that is available for editing. Also, each tile layer's tiles are downloaded to a tile package in the project's home folder. When a network connection is not available, you can edit the downloaded data using information in the offline tile packages for reference. Other web layers in the map and layers that access datasets on the network will be broken when a network connection is not available. Layers that access datasets on the local machine will remain available. Periodically, when a connection is available, you can synchronize your changes. This allows you to receive updates others have made to the web feature layer and to share your changes with them. On the Map tab on the ribbon, in the Offline group, click Download Map . A progress bar appears while data for the web feature layers is taken offline. When the process is complete, a geodatabase containing the offline data appears in the project's home folder. The database is added to the project. Feature layers in the map are updated to access the offline data. Annotation layers, dimension layers, and utility network layers in the web feature layer cannot be taken offline at this time. Each tile layer has a maximum number of tiles that can be taken offline. If your map covers a large area, the maximum tile limit will be reached at a given scale. The tiles that are downloaded will be suitable up to that scale and, when you zoom in further, more detail will not be available. If you zoom in closer so the map covers a smaller area, you will be able to take more tiles offline before reaching the maximum tile limit, and you will have more detailed reference data to use when you are offline. When a large number of tiles are taken offline, the tile package that is created will be larger in size and it will take longer to download the package. A 1 GB tile package can take 30 minutes to download with a good network connection. Check Include basemap & tile layers to take these layers offline. 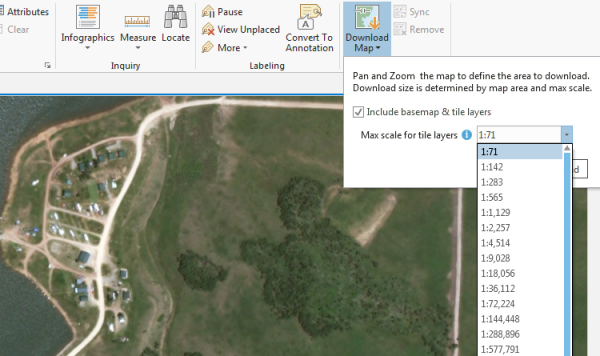 The Include basemap & tile layers option is available only if tile layers in the map can be taken offline. 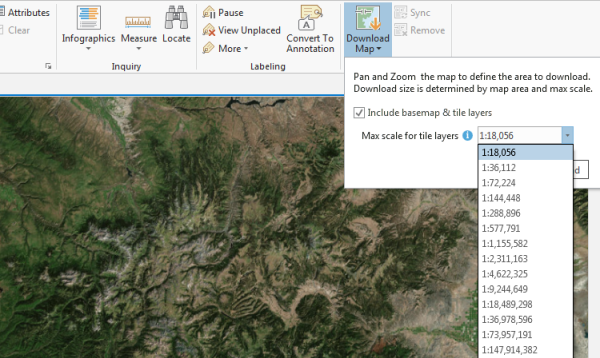 Click the Max scale for tile layers drop-down list and choose the largest scale at which you want to download basemap and tile layers. Zoom in or out in the map to change the scale at which tiles can be taken offline. A progress bar appears while data for the web feature layers is taken offline. When the process is complete, tile packages containing the offline tiles appear in the project's home folder. Layers in the map referencing the web tile layers that were taken offline are turned off. New tile layers referencing the offline tile packages are added to the map. Edits you make to your offline features can be uploaded when a network connection is available. Connect your machine to the network. Save any edits you made to the offline data. On the Map tab on the ribbon, in the Offline group, click the Sync button . A progress bar appears while your edits to the offline data are shared and you receive updates from others. When the process is complete, the map display updates to show the current offline data. If you no longer need to work offline, you can upload your feature edits and remove the local geodatabase. The tile packages that were downloaded remain available in the project's home folder if you need to use them again. On the Map tab on the ribbon, in the Offline group, click the Remove button . Your edits to the offline data are shared. The database containing the offline data is removed from the project and deleted from the project's home folder. The map layers are updated to access the web feature layer again. When the process is complete, the map display updates to show the current data for the web feature layer. If you did not save the project after taking a map offline, or if a map with offline layers is accidentally deleted, you can repair the project. In the Catalog pane, browse into the project's home folder. Right-click the tile packages containing the offline tiles and click Add To Current Map . Right-click the geodatabase containing the offline data and click Add To Project . Drag the feature classes and feature datasets to the new map.